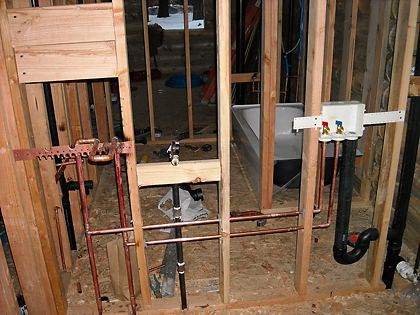 The plumbing system in your home is composed of two separate subsystems. The supply system brings fresh water in, and the drainage system takes waste water out. The water that comes into your home is under pressure. It enters your home under enough pressure to allow it to travel upstairs, around corners, or wherever else it’s needed. 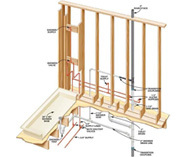 Water flows out of your home by the power of gravity alone; it passes through a system of pipes laid under your floor, and slopes towards the street where the main sewer line is buried underground. 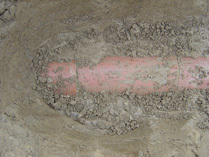 In many homes, the underground drain line between the house and the street sewer is made of clay. It is against state code to build over clay, so if the addition is proposed to be located in the front, it is recommended to hire a plumber to mark the location & depth of the existing drain. This makes it easier to replace if necessary. 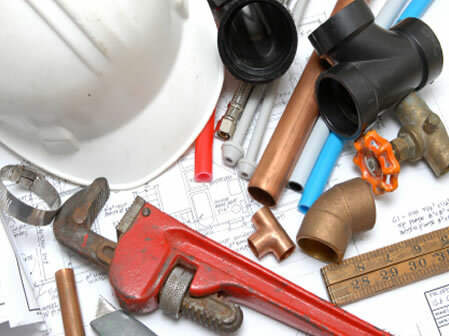 Do not rush to hire the plumber to change the line, as you might get a better deal from your contractor as part of the bigger project. Many houses are still equipped with old, galvanized supply pipes. Tapping new copper lines for the new addition to the old galvanized system is bad practice. When repiping the house, make sure all horizontal lines are at least 3/4-inch in diameter; the only 1/2inch lines should be the vertical sections next to the fixture. Additionally, insulating the hot water supply lines will save you energy and will get the hot water to the faucets faster. If your water heater is too old, consider replacement with a new, on-demand, tankless unit. These relatively new devices will return their cost through savings on energy bills in three to five years. Most units come with a 10- to 15-year warranty, and are expected to last even longer. 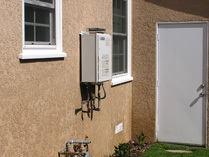 The tankless water heaters are small, and can be installed in or outdoors, so you might end up with an additional closet at the end of the process. Some heaters come equipped with a built-in, timer-operated hot water circulation pump to get you instant hot water during high traffic hours. 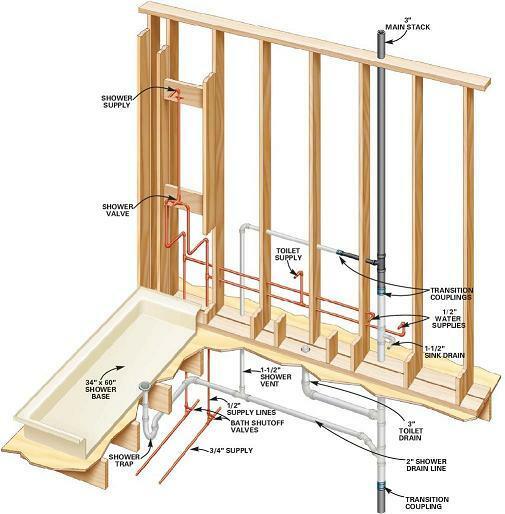 Most tankless water heaters will require a larger gas line than the old water heater, so it is very important to properly size the entire gas grid throughout the house to maintain proper function of all gas operating fixtures. 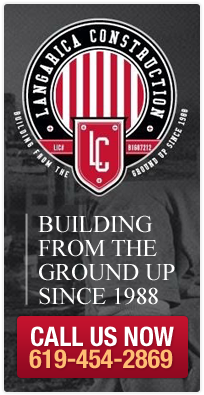 Laying out an efficient, well-designed system requires craftsmanship and experience. Keep in mind, every house is different. The plumber must decrease water pressure as it enters the home from the water main, and preserve enough pressure throughout various parts of the system to provide adequate flow. Calculating the downward slope of the drain, determining the correct internal diameter of a waste pipe, and providing adequate venting will determine how well your system sends waste water to the sewer. An unbalanced system will avert you from enjoying its full potential.